As I alluded last week in my Tips for Squaring a Quilt post, I have been busy with some secret sewing recently. For various reasons, I chose to use my domestic machine to do walking foot quilting on a rather large quilt (~60″ x 80″). 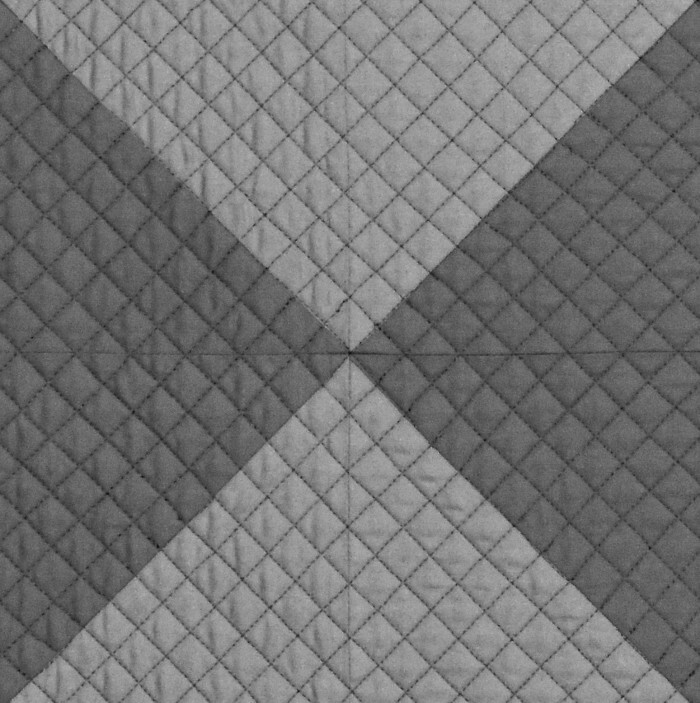 The quilting culminates in a fairly dense crosshatch at the center of the quilt, and I learned some lessons along the way that I thought I would pass along. I started on one edge of the quilt and made a long quilted line that would bisect the quilt roughly in half. Next, I rotated the quilt 90° and made another long quilted line that again marked the quilt in half. I then worked on a series of long lines perpendicular to the second quilted line, and after a short period of time, I ended up with tucks as I crossed over the first quilted line. This was just the first handful of quilted lines on a large quilt, in an area I planned to end up with a dense crosshatch, and I chose to pause for reflection. Instead of panicking, I simply set the quilt aside and chose to take a walk. As I was enjoying my time outdoors, the perfect solution dawned on me: quilt from the center out. Ultimately, I was slowly compressing the top of the quilt inward as I worked in one direction. The second, third, and fourth quilted lines were fine and did not need to be unpicked. The ninth, tenth, and eleventh were really started to develop a ripple between the quilted lines and tucks at the center. I unpicked, but only halfway back to the edge of the quilt, and I was very pleased with the results. If you look closely at the image below, you should be able to find a pieced seam running horizontally and vertically in the center of the image. If all had been absolutely perfect, my crosshatch lines should cross at the seams. Keeping that in mind helped me as I worked on the center quilting detail. I like to reduce the pressure of my walking foot when I am doing straight line quilting. However, every time I turn off my sewing machine and come back and turn it back on, I have to re-adjust this setting. I was pretty consistent about remembering to change this setting before getting started, but I developed a few more tucks and wrinkles before I caught my mistake. After that, I made a sticky note that I placed on my sewing machine every time I turned it off which was a visual and fantastic reminder to change my settings before getting started again after a break. Ultimately, I had to find a balance between the absolute perfection that I craved to create for this project, and an acknowledgement of my humanness. Nothing is quite as humbling or strong a teacher as a large project with ambitious goals and a tight deadline. Do you have any other tips for working with dense straight line quilting or crosshatch quilting that have made you more successful? I love straight line quilting but I’ve never done anything so dense or crosshatch. Thanks for the tips. I feel bad when someone shares the mistakes they’ve made, but then it’s a great resource for me. Thanks! Great tips and I’ve encountered the same issues too! I do a lot of dense straight line quilting. Using the seams from blocks is a great tip, as is marking lines throughout for consistency. I use the side of my walking foot and it is a huge time saver. The great part of dense quilting…once it’s washed you really can’t see the random puckers or not so straight lines! Good idea about reducing the WF pressure. I never thought about doing that and I bet it would improve my stitching. I always try to start in the middle but it can be more difficult than I planned. 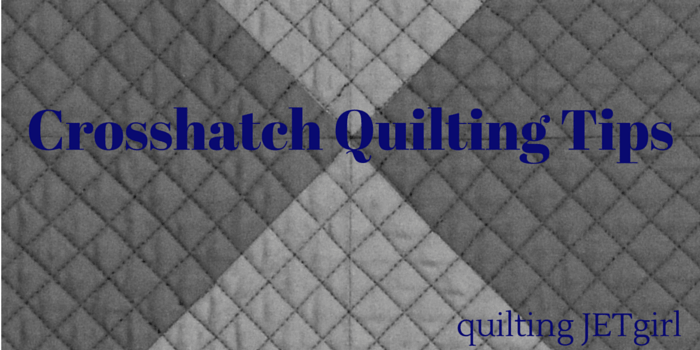 Yeah, you would think that straight line quilting would be easy – NOT SO! It’s more challenging to me than FMQ. Thanks for sharing what you learned, I’m bookmarking this for the future because I can make myself cray cray trying to get those seams perfect…and failing every time! Isn’t it funny how straight line quilting can be trickier than free motion quilting. I’ve not done quilting as dense as that, but I have used a few lines of masking tape to help keep my lines straight, especially when I don’t have perpendicular seams to guide me. I’m trying to remember if it worked out better to always start my lines from the same side of the quilt or if I got less puckers by alternating from one end to the other… Just to clarify – when you say that you started quilting from the center out – did you mean the exact center or just the center line? Looks like you nailed your crosshatching, even if you did have some frustrations with it. Can’t wait to see the whole quilt! I have avoided them … I so admire your work and determination. Good tips! I can’t wait to see this secret project! These are great tips! I think that marking every so many lines or inches really helps me keep things straighter as I have reference lines on both sides of my needle to align with. Yvonne, Thank you for sharing your experience with us and adding tips that helped you. I mainly do straight line quilting and my tip is that I like to split my quilt into 4 sections and quilt from the middle of the quilt outwards. Most of the time after the quilt has been washed, no one can see any of the little tucks or puckers which is fantastic. Thank you again for sharing and have a wonderful creative day. I am in the middle of a project in which I am using mainly straight line stitching and am encountering the same issus you did. Thanks so much for the very helpful tips, especially lightening the walking foot pressure. I can’t wait to try that tomorrow! I think people will look more at the texture than the exactness. I think it looks great! Not that I have any experience, but I have heard that if you are going to quilt densely with the walking foot that it helps to start with your lines farther apart across the area. Then you can go back and dive the spaces in half. For example, start one inch apart then go half an inch apart then a quarter inch apart… What do you think? I went through something similar recently while quilting my second shirt quilt. Number 5 rings true for me. Halfway though I was thinking about crying or unpicking. I persevered and now, strangely, I can hardly see the wonky bits that had me tearing my hair out. Easing the foot pressure definitely helps avoid puckers caused when layers move independently. The problem with lower foot pressure is I lose control of the stitch length and the stitches become more uneven. There is no win! This is a great post; I haven’t tried lines like these yet, but yours look great! Awesome photos, too (very helpful to see how you fixed those tucks and ended up with such straight lines). I used my walking foot with the thingymygig that came with it, a funny bended hook, I inserted it and voila, made beautiful even grids, wow!! Such good tips, and I especially love the post it one! I have that sometimes with stitch size, turning the machine off/on resets the size and I always forget for the first burst of sewing! I must remember your post it tip!